^ Official Documents to be in Mongolian Script. UB Post. 2011-06-21 [2010-07-11]. （原始内容存档于2011-11-01）. ^ 2.0 2.1 Mongolia. World Factbook. CIA. [2015-08-09]. （原始内容存档于2010-12-29）. ^ Odonkhuu, Munkhsaikhan. 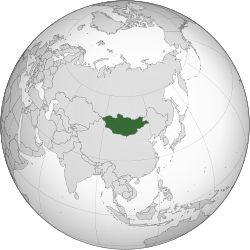 Mongolia: A Vain Constitutional Attempt to Consolidate Parliamentary Democracy. ConstitutionNet. International IDEA. 2016-02-12 [2016-02-21]. （原始内容存档于2016-02-25）. 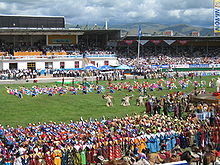 Mongolia is sometimes described as a semi-presidential system because, while the prime minister and cabinet are collectively responsible to the SGKh, the president is popularly elected, and his/her powers are much broader than the conventional powers of heads of state in parliamentary systems. ^ National Statistical Office of Mongolia. UBSEG.GOV.MN. （原始内容存档于2016-04-15）. ^ Gini Index. World Bank. [2011-03-02]. （原始内容存档于2015-02-09）. ^ Mongolia Standard Time is GMT (UTC) +8, some areas of Mongolia use GMT (UTC) +7. Time Temperature.com. [2007-09-30]. （原始内容存档于2007-10-13）. ^ Clock changes in Ulaanbaatar, Mongolia. timeanddate.com. [2015-03-27]. （原始内容存档于2015-03-25）. ^ Sik, Ko Swan. Nationality and International Law in Asian Perspective. 1990: 39 [2013-04-26]. ISBN 9780792308768. （原始内容存档于2013-10-14）. ^ 17.0 17.1 行政院大陸委員會：有關外蒙古是否為中華民國領土問題說明新聞參考資料 互联网档案馆的存檔，存档日期2013-10-04. ^ 18.00 18.01 18.02 18.03 18.04 18.05 18.06 18.07 18.08 18.09 18.10 18.11 18.12 18.13 18.14 18.15 18.16 18.17 18.18 18.19 18.20 18.21 18.22 18.23 18.24 18.25 18.26 18.27 18.28 18.29 18.30 郝时远、杜世伟. 《列国志：蒙古》. 社会科学文献出版社. 2007. ISBN 9787802308824. ^ 周強會見蒙古最高法院首席大法官. 新華網. [2014-12-17]. （原始内容存档于2016-04-14）. ^ （中文） 牛立伟. 草原轻骑：蒙古军队史话. 晚报文萃. 2013, (5). ^ Ban Ki-Moon on press conference in Ulaanbaatar, July 27th, 2009. Un.org. [2010-05-02]. （原始内容存档于2011-05-03）. ^ 23.0 23.1 23.2 23.3 23.4 蒙古国家概况. 中华人民共和国外交部. [2014-12-26]. （原始内容存档于2014-12-26）. ^ 存档副本 (PDF). [2016-01-31]. （原始内容 (PDF)存档于2018-01-12）. ^ Searchina　2009年7月21日蒙古極右勢力激烈展開「反華」示威─中國報紙. [2013-07-26]. （原始内容存档于2013-05-21）. ^ 何定照. 蒙藏委員會 今併入文化部. 聯合新聞網. 2017年9月15日 [2017-10-08]. （原始内容存档于2017-09-16）. ^ 中央通訊社. 蒙藏委員會 最快8月底裁撤. 聯合新聞網. 2017年8月14日 [2017-10-08]. （原始内容存档于2017-09-30）. ^ 蒙古筹资1.46亿美元修建乔伊尔—赛音山达—扎门乌德公路进展缓慢(转载). 天涯社区. 2010-05-13 [2014-12-20]. （原始内容存档于2014-12-22）. ^ 朱吉光. 蒙古国家总理出席赛音山达公路通车典礼. 2013-09-09 [2014-12-20]. （原始内容存档于2014-12-22）.